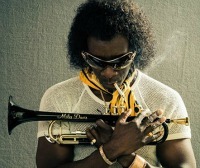 Miles Ahead, the movie, opened today at the New York Film Festival. Veteran actor Don Cheadle directed the film, which stars him in the title role (pictured). Since it became known months ago that the motion picture was in the works, speculation has been rampant about its faithfulness to Davis’s character and, particularly, about musical accuracy. An exclusive clip from the Yahoo website may address at least part of the concern. It shows Cheadle as Davis rehearsing “Gone” from the 1958 album Porgy and Bess. Gil Evans composed the piece, the only one in the album not written by George Gershwin. Jeffrey Grover plays Evans. Fair warning: the scene runs barely longer than a minute. Come back when it’s over or you’ll be trapped in unrelated Yahoo clips and ads. I was unable to isolate the clip from the extraneous material. To see Cheadle as Davis and Grover as Evans, go here. For comparison, here is the “Gone” track from the Davis-Evans Porgy and Bess album. Blending musical biopic standards (ill-starred marriage, drug addiction, record-company shenanigans) with caper-movie riffs (pistol-whippings, car chases, sketchy deals with shady characters), “Miles Ahead” at its best is as witty and knowing as Mr. Cheadle’s sly, whispery performance. The music is pretty good, too. The independent film is billed as going into general release today. See your local movie listings.